There's a Secret Stress-Free World of Money, Power, Health, and Charity. The residents of this world command 98% of the wealth in the wider world. They define the styles, technologies, incomes, relationships, politics, lifestyles, and standards for the rest of us. They are the Top 2% of society. YOU can easily JOIN THEIR RANKS! Isn't it finally time for you to control your own life? Isn't it time for you to live stress-free, with unbounded health, ample cash reserves, and the joy of giving without hesitation? If your answer is yes, then keep reading. Because you are about to discover the REAL secrets of power, wealth, and control. Secrets about attracting... and keeping... massive piles of money. Secrets about finding and living your God-given purpose in life. Secrets about doing more in a few hours than some people do in a year. Secrets to enjoying unbounded health, energy, and vitality. Secrets about total fulfillment, joy, and peace of mind. This vault of secrets will give you what I call "The 2% Advantage." You see, the Top 2% of our world — those who command the most money, wealth, health, and respect — do so precisely because they possess and use these secrets. Right now is the time for you to join them — the Top 2% of our society. And that is what this letter is all about. It's about you smoothly and rapidly making the transition from where you are now... to being a full-fledged member of the Top 2%. The journey can be a lot easier and faster than you think. In fact, when you have access to the 2% Advantage vault, all the old "rules" of success melt away. What Mental Demons Are You Battling? "Hey mister... can you spare some change?" It was August of 1997. I was walking out of a big, shiny office building. A popular international adventure fitness magazine had asked me to do some consulting for them. I was respectfully dressed and carrying a classy eel skin briefcase. I had bought the briefcase a few years earlier because it made me feel important. The question jerked me out of my self-absorbed thoughts. I looked over at the man who had approached me. He looked insecure — almost scared. Desperation and hunger clearly showed in his eyes. Looking at him, I was suddenly struck with a sickening fact... a fact that nobody but I knew. I swallowed hard and turned my head, a little ashamed. You see, I LOOKED like a successful guy, but inside, I felt like a phony. Looking back at him, I replied, "Hey buddy... I'll bet you're better off than I am. You're probably at zero... and me? Well, I'm $15,000 in debt and still plummeting." With that awkward exchange, I handed the guy a couple of bucks, got in my car, and drove away. But something changed inside of me that day. You see, the sad secret in my pocket was that my life was actually spiraling out of control. I was on the verge of bankruptcy. I eventually found myself more than $100,000 in debt. I looked confident on the outside, but inside I was dealing with major emotional and mental demons. Not long after meeting this homeless guy, I myself was basically homeless. I had to sell everything I owned... furniture, paintings, cars, my home... even some of my clothes... just to make ends meet. It was a dark and ugly time. Now let me tell you about my life today. I'm proudly a member of the Top 2%. Just one of my inventions — The AB-DOer® — has generated more than $400 million in revenue. It is one of the most successful pieces of midsection exercise equipment of all time. My health, fitness, and motivation books, ideas, seminars, and products have positively influenced more than 4 million people around the world. Because of my personal transformation, millions of people are happier, healthier, stronger, and more productive. Many of these people now wake up every morning feeling healthy, successful, and vibrant. It's an awesome feeling to have this ability to positively change people's lives. It took me just six months from the day I lost my home and all my stuff to realize a total transformation. At 180 days to the date, I received my first royalty check for my first exercise invention. Within three months of that sale, I was totally debt-free. But, it gets even better... and I mean a LOT better... within 12 months, I was a multimillionaire. Still am today. But, more important than the money, I now have true wealth. I am wealthy inside because I have learned the secrets of the Top 2%. For example, I have discovered how to turn adversity into victory. My spiritual life is right. My attitude is right. Each day, I feel relaxed, energetic, joyful, peaceful, and passionate. And so can you. Yes! I want to join the Top 2% and begin living a stress-free, unlimited-wealth lifestyle. I can order today at a special discounted price! The Path Is Now Cleared for You! I don't know about the exact mental skeletons and mental demons that you're battling. Maybe there are secrets of misery, doubt, fear, and lack of money for your family, and just overall stress that you carry around inside of you day after day. If there are, right now is the time to get rid of all that. It's time for you to live life to the fullest. To become truly enriched in all aspects. It's time for you to have everything you've been dreaming about. It's time to enjoy the power to give to others and really bless their lives. The thing that made the difference in my life was connecting with Nightingale-Conant. The first program I listened to was by Napoleon Hill. Many other programs would follow. Making money... enjoying peace of mind... experiencing total fulfillment... it is all very much like getting yourself into tip-top physical shape. I know that when I do the right exercises and eat the right food, I'm guaranteed results. I know I'm going to be stronger and more productive, and feel my best each day. It's a clear example of the Universal Truth of cause and effect. Success in life is the exact same way. If you know and follow a simple set of "secrets," you will get the results. It's guaranteed and it's inevitable. In the middle of my downward spiral, I realized the only thing I needed to enter the world of the Top 2% was to get my hands on their secrets for living. And, of course, I had to have the courage and tenacity to live by these secrets so that they could get inside of me. Ironically, I discovered that I already had everything I needed. It just needed to let it surface and express itself inside of me. What I lacked was the right coach and the right direction. And that is exactly what Nightingale-Conant gave me. In fact, I believe it does that better than any other organization in the world. in Only 2 Minutes a Day! Vic Conant... working with Nightingale-Conant's CEO, Gary Chappell... plus a team of crack-shot researchers... and the greatest collection of thought leaders, gurus, and truly wealthy people... has developed the ultimate system. It's made up of the absolute best of the best. It's been specifically designed to allow you to rapidly realize your dreams and safely enter the world of the Top 2%. No longer will you be forced to spend years researching, listening, digesting, or trying out success secrets. The core secrets... the best-of-the-best secrets... have all been assembled for you. They have all been gathered up into one easy-to-access location... and are all inside a new, very powerful system. I'm about to reveal to you the secrets that will make you a Top 2% producer, no matter what field or profession or business you are in. Yes, you can (and should!) join their ranks. It is time... time for you to become a resident of their secret world of power, wealth, charity, and peace. I believe that no other organization in the world is better equipped to hand you the secret vault of the 2% Advantage than Nightingale-Conant. For more than 50 years, it has been the Gold Standard for personal development and achieving uncommon levels of wealth and happiness. Nightingale-Conant's list of authors is the ultimate "Who's Who" in the world of human success, achievement, wealth, and peak performance. In all, they've published programs from more than 200 authors. Each has devoted their lives to helping people like you and me find greater wealth, better health, more power, and deeper happiness. Their individual messages have literally changed the world. As I said, no other company on the earth has this depth of resources. It's the greatest collection of success secrets ever put together. The Top 2% is a very simple system, really. As I said, Vic Conant, Gary Chappell, and a top-tier team of researchers have combed through Nightingale's massive vault of personal development, wealth-attraction, health-boosting, and spiritual-enrichment programs. They were looking for clues... patterns of success that were common among the greatest men and women of the past 100 years. "If you wanted to become one of the Top 2% most powerful, wealthiest, and happiest people on the planet, what thoughts, skills, and ideas would you need to master?" That was the burning question. They discovered 17 secrets to be able to easily and safely join the ranks of the Top 2%. Just 17 secrets? Seems low, doesn't it? Yes, I was a little surprised too. Most people think they have to master an endless list of skills and wisdom. But, the team found that it's really much simpler and easier than all that. Today's Top 2% use a number of traditional success secrets. No surprises there. But, what's amazing is that they have also developed a whole set of totally new techniques and strategies for living lives of uncommon wealth, health, and charitable giving. In a way, this makes sense, doesn't it? The world is rapidly changing. It's a new playing field out there. Our parents didn't deal with the Internet, global travel, GPS systems, iPads, smart phones, and the like. A new world presents new challenges... and new opportunities. It makes sense that the Top 2% of our society would formulate new strategies for wealth, health, and happiness. Vic, Gary and their team have leveraged Nightingale-Conant's unique position to uncover and quantify those new techniques, strategies, and approaches. And now you have them in your hands. In Session Three, "Getting High-Octane Performance Fuel," you'll discover a single question that formed the core of Oprah Winfrey's empire. It's so powerful, that Tony Robbins uses the same question to impact millions of lives and make millions himself. You too can instantly put it to use. During Session Five, "Shedding Your Self Imposter," you'll be freed of the damaging myth that "self-esteem" is critical to success. Finally being free of this weight, you'll then be empowered with a simple 12-Question guide to unlock unstoppable self-power. 98% of all "self-help" programs get this wrong... especially for the new world we're facing. Taking the insights of more than 120 CEOs and the current research of one of the top 50 greatest thinkers of our day, Nightingale-Conant crafted "The Flexback Technique." You'll get it during Session Seven, "EVO-Learning." This system contains the secret key to having passionate relationships, untiring happiness, and deep-rooted personal fulfillment. Do you ever feel tired... I mean weary? Weary of the fight, tired of the struggle of life, worn out by the rat race? We've all been there. How would you like to put all that stress and fatigue behind you forever? A totally new life, full of energy and wealth, is what you'll discover in Session Six, "The Always OnTM Process." You'll discover a way to fully "resign" from the old life and instantly begin your new life. Are you ready to totally eliminate money worries? Close your eyes and consider what a life free of money stress... a life of no-resistance income... would be like. The relief of just imagining such a life is palpable, isn't it? During Session Thirteen, you'll learn the world's most obvious secret... it's a strange paradox that will cause money, happiness, and freedom to flow to you effortlessly. It requires no special skill, no training, and no money. You have it in your hands now. In Session Ten you will unlock your "M.A.P to the STARS." I think you and I have both heard endless rhetoric about "self-discipline," haven't we? It's another myth that is holding you back... at least the way 98% of people talk about it. The Top 2% see the topic drastically differently. Using a revolutionary M.A.P (Mental Alignment Process) technique, you'll never fight yourself for success again. Another new technique to help you live your dreams is called the O.W.L. Method. Have you ever missed a goal? Failed on a project? Is your life exactly what you'd like it to be? Discover a secret method George Washington used for managing disaster... but with a modern twist. You'll never experience failure the same way again. Having effortless joy, health, wealth, and personal power is the "holy grail" of personal development, isn't it? During your "STARShop Workshop," you'll learn about "Sleep Programming." It is just what it sounds like... a way to reprogram your mental and emotional state so that you naturally and effortlessly command success. They've prepared 28 "Sleep Programming" sessions for you. Each is calculated to embed deep inside of you the traits, skills, and attitudes of the Top 2%... while you sleep. Find out how you can instantly become an "Innovateur." All modern members of the Top 2% hold this distinctive title — without exception. Do you know people who never seem to miss? They have the "luck of the Irish"? Money, happiness, and fulfilling relationships seem to just flow to them? That's because they are "Innovateurs." Now you can be one, too. Have you made mistakes in your life that you are ashamed of? If not, you're either not human... or you're seriously arrogant. I think we all have made mistakes. What if I told you that these shameful mistakes are actually key to being one of the Top 2%? Shameful acts are like plutonium rods... you can use them to make nuclear bombs or unlimited energy cells. Most people let mistakes destroy their lives. You'll discover two new methods... "Photoshop Your Past" and "Virtual Reality Imaging"... you can use to instantly convert your past into powerful success energy. Charles Schwab said, "A man can succeed at almost anything for which he has unlimited enthusiasm." So how do you get that kind of "unlimited enthusiasm" so that you become unstoppable in your pursuit of giving, living, and loving? Personally studying the lives of dozens of the highest-paid CEOs and business owners in the world, Nightingale-Conant has discovered a remarkable 7-Part Daily Routine that unlocks this treasure trove of enthusiasm. Is your health — your physical vitality, energy, and well-being — where it should be? There is a magical, very simple "Triple R Formula" that you should be using. It literally drains stress out of your life and infuses you with vitality and power. It clears your mind and infuses creativity, innovation, and strength. It's time to put it to work for you. While so many health programs focus on intake, counting calories, and exercise, we've found out that the Top 2% don't really take this approach in their personal lives. I guess that's why such programs are so popular... they are designed for the 98% who struggle with health, wealth, and happiness. In contrast, Nightingale-Conant has put together "The QuickFitTM Program." It is a series of attitudes, habits, and health secrets used almost exclusively by the Top 2%. It is now yours. Have you ever felt you were meant for greater things? Is there a calling in you that demands to be heard? You're not alone. All of the Top 2%-ers that Nightingale-Conant researched felt this stirring. You were meant for greatness. They call it your "One True Thing." Do you know what yours is? In Session Two, "The Top Quality of the Top 2%," you'll unlock your "One True Thing." It's the power you need right now to break free. It's time. I have just given you a glimpse of what marvelous treasures you'll find inside The Top 2%. There is simply not time for me to tell you about the dozens of other new techniques Nightingale-Conant's research team has discovered... modern, tested, proven secrets hidden from rest of us... but used by the Top 2% to achieve a life of giving, loving, and sharing. Or the more than 30 other new systems, techniques, methods, and strategies we've uncovered or created to help you join the secret world of the Top 2%. We've all heard of SMART Goals (Specific, Measurable, Achievable, Realistic, and Timely), haven't we? But, I have to be honest with you... It's an okay approach to goal setting for those content to live in the 98% of society. Don't get me wrong, setting goals is essential to your success. But if you just use formulas like SMART, you'll never reach the Top 2%. There's a better way, and it's called "Goal Scoping." Business giants like Steve Jobs, Michael Dell, Bill Gates, and others have long used this unique and different approach. It's perfect for our fast-paced, ever-changing world. It's what you need. That's all I can say about "Goal Scoping" right now. You simply need to experience it for yourself. 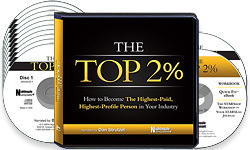 The Top 2% is, without a doubt, the most current, most comprehensive, most in-depth system for creating wealth, ensuring total happiness, and enjoying limitless health that Nightingale-Conant has ever released. And... on top of all that, this unique new system delivers results in your life rapidly and much more easily than traditional programs. No other company or group in the world has access to the volume or level of personal development resources that Nightingale-Conant does. That's why I am confident in saying that I believe this is the ultimate program for creating rapid, lasting, transformational success in your life. There is nothing else like it... bar none. Considering that they have pulled from the experience and wisdom of hundreds of health, personal development, wealth, and time-management experts to build this system for you, it would make sense that this should be their most expensive program. You might expect to pay hundreds for this level and quality of information. 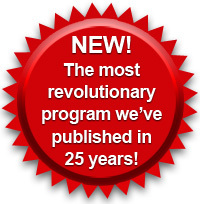 As you'll see, you will not pay anywhere near that for this revolutionary program. Knowing what the 17 secrets of the Top 2% are is big. But it's not enough. You actually have to make them a part of your life. And that is why I'm so excited to introduce to you something magical... it's what Gary calls the "2 x 2 Formula." It is a powerful new technique for getting these 17 Top 2% qualities deep inside of you... using just 2 MINUTES of your day, for the next 28 DAYS. This formula will allow you to quickly instill in your heart and soul the skills, thoughts, and attributes used by the Top 2% of our society. I'm not saying you will not need to do work. You will — of course. But, instead of grinding away like an apprentice... you'll be working quickly and naturally like a master craftsman. The results you're after — happiness, wealth, health, and membership into the secret society of the Top 2% — will flow rapidly and effortlessly. Order The Top 2% RISK-FREE today! I have told you just a handful of what The Top 2% can and will do for you. As I said, these are the exact 17 core secrets used by every Top 2% players in our society today. This is your time to join them. They live lives of stress-free happiness. They give to charities and worthy causes without hesitation, because they can. They attract wealth and bask in rich relationships. It's a life that you have been reaching for, isn't it? With The Top 2%, you can ACHIEVE that life. Without the learning curve. Without the guesswork. Without the obstacles. Click on the link below right now to have The Top 2% shipped to you immediately. As always, your order is completely risk-free because your satisfaction is guaranteed. Order today, and if you're not completely satisfied, you can return The Top 2% any time during the next 30 days. We'll issue you a full refund of the program price or give you an even exchange — whichever you prefer. In the days and months ahead, using The Top 2% you can expect to climb out of the overpopulated world of the 98% underachievers... and begin your new life as one of the Top 2%. I look forward to welcoming you into our ranks. YES! I want to join the Top 2% and begin living a stress-free, unlimited-wealth lifestyle filled with generous giving, abundant happiness, and rich relationships. Please send me the 11-CD program The Top 2%: How to become the Highest Paid, Highest Profile Person in Your Industry — along with the writable PDF workbook, Quick Fit eBook, Your STARS Log journal, "Your 2 Minutes to 2 Exercises" bonus CD, and a printed journal — all for just $119.95 (SPECIAL LIMITED TIME OFFER! ), which is 70% OFF the regular program price. If I don't rapidly and magically transform my life and join the Top 2% of society using The Top 2%, I will simply return the program within 30 days for a full refund. No questions asked.